12 Essential Leadership Traits | Are You Being Real? 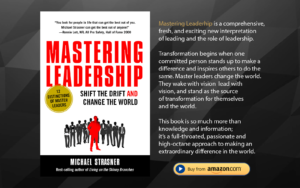 4 years ago, I participated in a 6 month intensive leadership program created and facilitated by master teacher & coach, Michael Strasner (bestselling author of Living on the Skinny Branches and his newest masterpiece – Mastering Leadership: Shift The Drift & Change The World). In this program, I was introduced to Michael’s 12 senior leadership distinctions and challenged to dramatically elevate my leadership, which led me to create my 1st authenticity workshop and spawned the Are You Being Real Podcast. Needless to say, Michael’s work was life changing for me, and his 12 leadership distinctions continue to serve as my roadmap and playbook to navigating through any challenges that pop up in an area of my life. With the launch of his new book, that inspiringly lays out these essential leadership traits, I am excited to share them with you, so you too can benefit. Read them over, save them, and get a copy of Michael’s book for a more thorough deep-dive (link below). 1. …have a clear & powerful vision as to what they want to create. 2. …have an unwavering commitment to their vision, never giving up. 3. …live by values that support their mission & make choices that forward their vision. 4. …inspire others to support & join the mission. 5. …are change masters, being able & willing to pivot whenever necessary. 6. …are risk takers, living outside of their comfort zone to make their vision a reality. 7. …take responsibility for everything, knowing that if it’s mean to be, it’s on them. 11. …have incredible character, showing up in ways that people respect & want to follow. 12. …create leadership in others, the truest form of leadership. If you’re eager to change your world and step into your next level of leadership, grab a copy of Mastering Leadership, and feel free to check out Episode 201 of Are You Being Real! Michael and I go deep into why Michael is so committed to creating leadership in others, which three leadership distinctions help us most to live authentically, and what he feels everyone should do to live a life of self-worth. Wishing you an impactful, world-changing week full of holiday cheer!